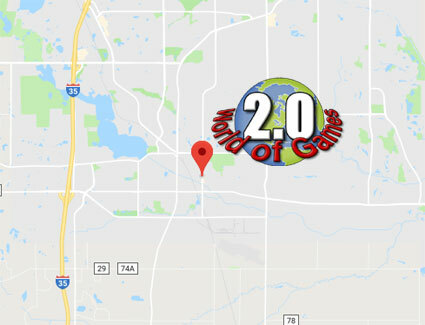 World of Games 2.0 is a Specialty Retail and Local Game Store located on Holyoke Avenue in Lakeville, Minnesota. At World of Games 2.0, we offer Collectible, Vintage, and New Video Games, Comic Books, Figurines and Miniatures, Role-Playing and Board Games, Sealed and Single Trading Cards and much more to the Bloomington, MN area. Whether you're a Console Gaming Hero or a Tabletop Game Enthusiast or whether you want to catch up on your favorite Graphic Novel or just want a new Tasty Peach Plush, World of Games 2.0 can help! in Lakeville, MN. Whether you want to play at Friday Night Magic or want to join a Dungeons and Dragons campaign, our family and female friendly store easily porvides the excellent entertainment and atmosphere for people of all ages. We offer a variety of products including Magic: the Gathering, Tasty Peach, Yu-Gi-Oh, Pokemon, Dungeons and Dragons and much more for the Bloomington, MN area. For more information on our weekly and other events including Friday Night Magic, Free Comic Book Day or our Casual Commander and SCG Modern nights, visit our Calendar page. If you need storage for your Trading Cards, want to expand your Comic Book collection or need a spare controller for your Playstation, Xbox or Nintendo system, we can help you find what you need! Whether your favorite past time is playing Table Top Games, trading cards with other people from your neghborhood, or love playing Vintage Video Games, visit World of Games 2.0 and see what's in store for you. From extra dice to the most recent addition of your favorite comic to used video games from a variety of consoles to specialty additions to your collectible card collection, we can help with all your local gaming needs near the Bloomington, Minnesota area at World of Games 2.0. To visit us so we can help you with your Collectible, Vintage, and New Video Games, Comic Books, Figurines and Miniatures, Role-Playing and Board Games, Sealed and Single Trading Cards needs near the Bloomington, MN area, visit our Contact Us page for more information, or stop by our store in Lakeville, Minnesota on Holyoke Avenue. To stay up to date on the latest happenings in the store and to stay connected with us, like us on Facebook.